We’re at Stop #4, Chuo Koen, which literally means “Central Park”. Hmm, not quite as grand as New York’s, but Kamiyamada’s Central Park serves as the town’s main ‘hanami’ spot with the cherry trees in bloom around mid-April. After playing on the swings and slides, head over to the southwest corner of the park and you will see a collection of stone and marble monuments. The middle one is a tall, slender black slab with 3 kanji characters on it: Ho-Jyo-Tsuka. 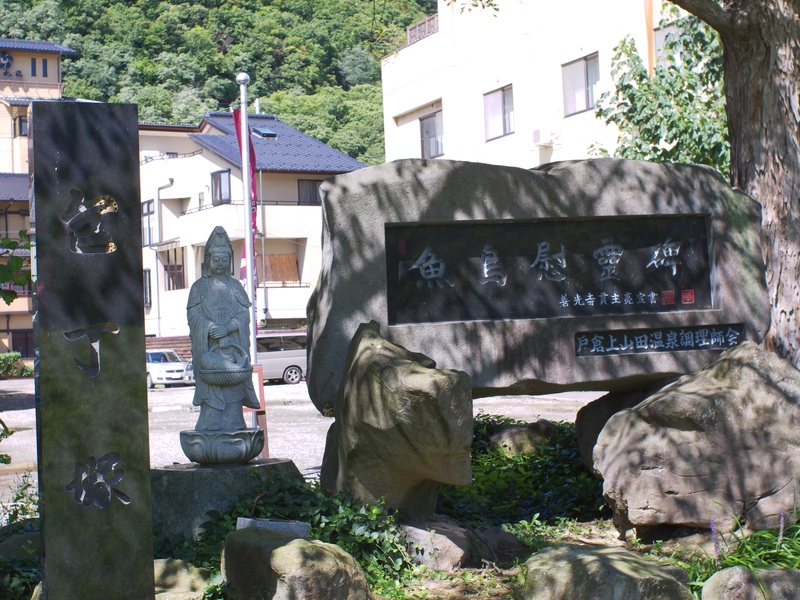 It is a memorial for ‘hojyo’, chef’s knives. There are 30 inns and hotels as well as over a hundred restaurants here in Togura-Kamiyamada, each with a full kitchen and professional chefs. To those chefs, their knives aren’t just inanimate objects. They have a soul. So when it comes time to discard them, the chefs guild has traditionally held a ceremony here to bless their used knives, hence this memorial. It’s a sign of the commitment and dedication the chefs have, and a reason visitors should partake of the local cuisine when staying at Togura-Kamiyamada.